On my walk from home to school every morning, I’ve noticed the consistent whiffs of chocolate around the intersection of Windsor and Main streets in Cambridge. At first I speculated that this smell was related to the morning operations of Flour Bakery, located a couple of blocks away. But after isolating this luscious aroma to a particular intersection far enough away from Flour, I realized that there had to be some other culprit. A google search revealed the existence of a Tootsie Roll factory on 810 Main Street. Even more exciting than discovering this single factory was learning that Cambridge used to be a hub for candy manufacturers until very recently. In fact, the Cambridge Historical Society has an entire website dedicated to these sweet memories! 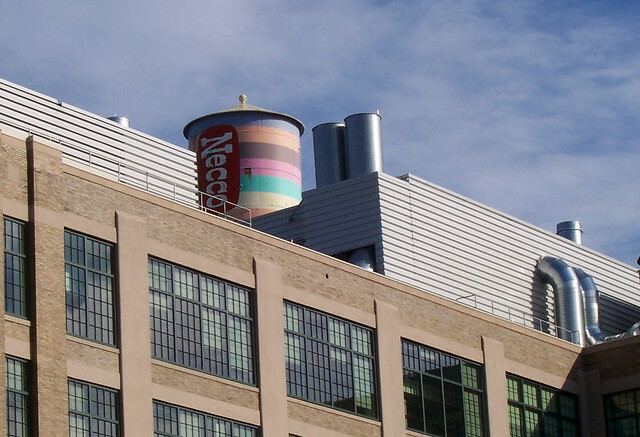 Iconic Water Tower with Branding of Necco Wafers, produced by the New England Confectionery Company (Necco). Photo Credit: Flickr/Jill Robidoux. The factory on 810 Main is the last standing relic of this history as candy manufacturers have moved out of Cambridge to lower cost locations, making way for a host of high-tech firms and biomedical companies. Novartis Institutes for Biomedical Research now occupies the building that used to be the largest candy making facility in the world when it was constructed in 1927. 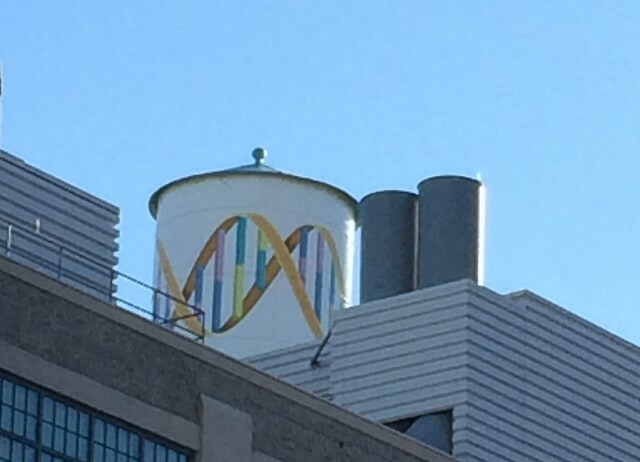 The iconic water tower on this building that used to look like Necco wafers has now been repainted to match the identity of its new owners. It is fun to imagine what Cambridge used to be like with its cluster of candy, when many more intersections smelled like the corner of Windsor and Main. It is also interesting to reflect on the demographic shifts that likely accompanied the industrial shift from candy manufacturing to biotech in Cambridge. A century ago, this part of Cambridge provided jobs for many unskilled workers, many of whom were recent immigrants. Today, there are far fewer employment opportunities for people without college degrees. The diminishing candy industry offers one entry point into understanding the recent process of gentrification, and the politics of ownership and belonging in Cambridge. Post, maps & images by Insiyah Mohammad Bergeron (unless otherwise noted), an urban planning student at MIT. Connect with her @InsiyahMohd. Discovery Walks is a blog series that challenges residents to actively use their senses to guide urban exploration. To submit a Discovery Walk from your city, check out this post.